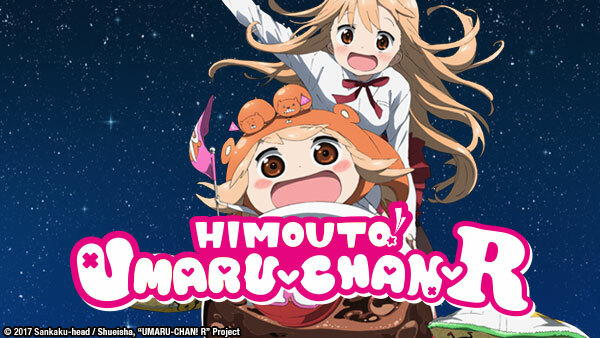 Sign up now to stream Himouto! Umaru-chan R, subs, tons of dubs, OVA's, simulcasts, plus the all new Dubcast℠ editions and more! Umaru Doma's life continues with an evening filled with video games... and no big brother in sight! Later, Umaru and her friends end up playing an intense game of soccer. Taihei invites his coworkers over for dinner after work, and one of them, Alex, catches Umaru's attention. Why does this guy seem so familiar, and what's his deal with anime? Alex interrupts Kirie and Umaru's afternoon to play a dating sim game. Kirie finds herself identifying with the main character. Later, Umaru discovers an addictive new game. Umaru spends Christmas evening with her friends, and Sylphyn remembers a childhood Christmas wish. On New Year's morning, Umaru receives a suspicious gift from Taihei. Taihei leaves for a business trip with his co-workers. While his boss Kanau thinks of a way to spend time with him, Taihei has his hands full with a vacation-happy stowaway. While visiting Umaru, Kirie’s secret aspiration is found out! Will Umaru’s encouragement be enough to help Kirie overcome her self-doubt? Umaru and the girls head out to spend a fun day at the amusement park, but Kirie is having a few struggles. Will the day end up a total disaster? After Bomba gives Taihei one of his old cameras, Taihei spends sometime reconnecting with Umaru. Later, the tension between Hikari and Umaru increases. Sylphin invites UMR over to her house, where a slight misunderstanding leads to some awkwardness. Later on, Umaru seems to have found a weakness in Hikari’s armor. Kirie devises a new plan to bring Ebina and Taihei closer. However, Taihei might have a couple to many little sisters fighting for his attention already. It's the end of the year, and everyone is figuring out what Christmas gifts to get their loved ones. Can Umaru and the others find the perfect presents?